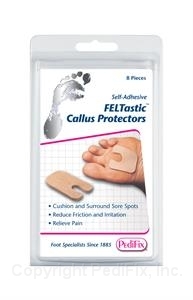 The Podiatrists’ Choice® to absorb pressure and friction while comforting calluses, blisters and other foot problems. Self-adhesive backings keep them securely in place on the ball-of-foot, back of heels, or anywhere protection is needed. Trimmable. For use on foot or in shoes. 8 per pack.